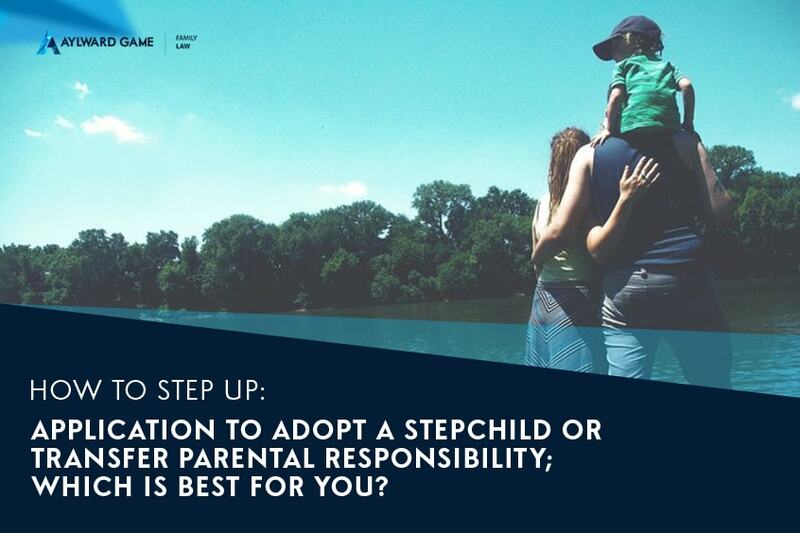 How To Step Up: Application to adopt a stepchild or transfer parental responsibility; which is best for you? We have been asked a number of times about adoption of children by step-parents. This is an area where the state and federal jurisdictions intersect, and the process can vary between the states in Australia. In QLD, whilst it is possible for a step parent to apply to adopt a child, this is not an option that is frequently followed. Making the right choice between adoption or applying for parental responsibility by consent can have a significant impact on all parties involved, most importantly on the child or children. The decision is primarily based on the unique circumstances involved and the way in which you proceed can also affect the time the application would take and the level of financial outlay on legal fees. The QLD Govt website has some information (and the form that you would need to complete if you applied for step-parent adoption). This form confirms that to make an application for step parent adoption in QLD you first need to apply for and receive the leave of the Family Court of Australia. Adopting a stepchild is therefore a two stage process. The application to the Family Court is a separate application. As there are two applications this can be a relatively drawn out and expensive process. As well as obtaining the leave of the Family Court there are a number of additional criteria that you must satisfy. The alternative that we generally suggest is to make a single application to the Family Court for an order transferring parental responsibility from a biological parent to the step-parent. This would give them the same legal standing as the child’s remaining biological parent for all legal matters, such as choosing schools, consenting to medical treatment and applying for passports and it would not affect any position regarding inheritance between the child and their biological parents. It would not trigger the issue of a new birth certificate and would normally not significantly affect the position with the CSA. If both biological parents are prepared to consent to the transfer of parental responsibility this would be a relatively simple matter of preparing some documents and submitting them to the Court for approval. It is possible that the Court would be willing to make an order like that by consent and without any need to attend at the Court as all parties would be in agreement. Aylward Game Solicitors have made this type of application to the Court previously and were successfully able to obtain orders for a transfer of parental responsibility from the Court on that occasion. If we can be of further assistance please don’t hesitate to contact Aylward Game Solicitors and speak with our Mr Ian Field for more information on 1800 217 217.